Oh. Should have been able to figure that out myself. Thanks, RT! Sheil Wood to Georgia Tech. Riase likely to GT also as he interviewed as DL coach there... Gasparato gone already... Nash not retained...Hearing Brown leaving... That leaves Lang Connelly Romero Green and Wheeler... 5 returners and 5 new guys... I like the mix of old and new... Should provide new ideas and holding on to some things that have made us good. I haven't heard Brown leaving. He recruited the new recent commit at wide out I thought? Also it's not a terrible thing to have some of these coaches leaving. Long term, it means we have more capable coaches out there getting diverse experience. So we'll have candidates with more diverse resumes for new coordinator/head coaches in the future. If the Josh Conklin experiment pans out, and I think it will, we'll have made a successful transition to division one. If not, we're in trouble. The difference between creating a good team and establishing a great program is the ability to have the next guy up at head coach be successful. Mike Ayers built us a great team and a great program, but the question of whether our success is dependent on the man or the program will be answered in the next couple of years. There's a big gap between the costs and the benefits of the decision to go out of staff. The cost is we lose some of the guys who have been around forever. The benefit is a coaching tree that branches out like it is now. Whether or not that cost/benefit will pan out depends on how we perform on the field and in recruiting over the next couple of years. I imagine we'll take a recruiting hit this year, but thankfully we have a good nucleus of guys coming back and we haven't had a lot of freshmen start for us traditionally. Where is Coach Nash headed? I think a lot of Nash. Don't assume we will take a recruiting hit. We are still extremely attractive to those we were speaking to earlier; just because they did not sign by Jan. does not mean they will not sign in Feb. Our new coach is also likely to have connections and familiarity with players and high schools that will give us new exposure to recruits. Wanted to mention earlier about departure of coaches but I figured everyone was too on edge. And if I dared mentioned that the DCoordinator was departing some would have cried doom and gloom. But I do think this bodes well for the program in the long run. 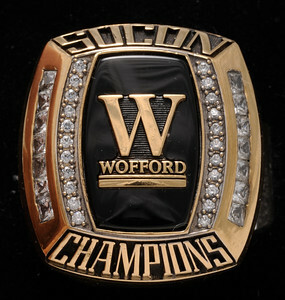 Wofford became too predictable and the fan base was not at a fever pitch with enthusiasm. We had a 1/2 empty stadium for a FCS Quarter finals game. I guarantee opening day 2018 we will have more butts in the seats than we did for the playoff game. There are renovations to football facilities, new faces on coaching staff, new players impacting the game. Hopefuly we can strike up new excitement with fans and recruits by having no restriction on uniform combinations, helmet logos, and how about a "BlackOut" Uniform! Cant wait for spring ball. Even for us old guys change is good. It brings new blood and new ideas and keeps it from getting stale. We have just about completely turned over the whole assistant coaching staff in basketball and kept on going. Besides, one of the few ways for the coaches who came through our program to advance is to go where they are needed and will be paid. We have all said on this site that the apathy of the community to Wofford football is depressing, even when we have a great product on the field. Perhaps shaking it up will put folks in the seats. I agree that if we couldn't fill Gibbs for the playoff game between Wofford and Furman at a time when there was no competition from Clemson or USC then there is a problem. None of us knows the real cost of our football program. Maybe it is time to figure out if it is going to be attractive to outsiders. Do we have any idea who may come aboard with Conklin? Just a guess STT, I could see Wofford offering the DC job to Coach Riase which could be enough to make him rethink the FBS position gig over a FCS DC gig. Randy Melvin whom Conklin had on his defensive staff at FIU is with a CFL team at the moment. Plenty of knowledge there and I would think that salary is on par with an FCS DC gig. Tim Cooper who is DQC at Pitt and has worked with Coach Conklin and could be candidate. Coaching experience at IU, Miami OH, and Butler. I ran into Dane Romero at the airport earlier this week. He was heading out to "close out" some hopeful commits for signing day. He was very upbeat and was extremely excited about Coach Conk and the direction of the program. He seemed very eager and motived which I thought was a great sign for things to come.